Good afternoon, my friends! I hope this day's treated you well. So I was thinking we'd talk a bit more about self-care routines ... we addressed the when aspect (as in, when do we fit it in), but how about the what and the how? I.e. what do you use and how do you use it? I will preface my own responses by saying that ideally I would buy all my health and beauty products at some place like Whole Foods - things that have been ethically tested, responsibly made and minimally packaged - but that's not always a budget-friendly option! I am also somewhat of a stickler for things that work ... in other words, if I like how something feels/smells/works - I stick with it. Consequently, many of these products I've been using for years and years! Note: This brand is very inexpensive, but honestly, these products work really well for my hair type. My hair is longish and wavy (or curly depending on the relative humidity), so I need moisturizing products. This duo leaves my hair soft and manageable, and I absolutely love how it smells! I wash my hair every other day ... daily washings leave it too dry. Haircuts - how often? Every 6-8 weeks I get a trim. I've been going to the same hairdresser since before I was married! (Bill sees him too - he's fantastic, and he's become a good friend.) I keep my hair on the long side these days, but I have worn it in a bob and even shorter when the boys were very little. I just have to make sure to have layers because that's what keeps my hair curly. If I let the layers grow out, my hair just hangs and has no "spring." Color - yes, no ... or no comment? Yes! My hair is naturally dark brown, but I am quite gray at the part, thanks to my Irish heritage. (Or so I'm told. It could just as easily be from raising three sons!) So I do color my hair every couple of months (my mum does it for me). I use Garnier Nutrisse Cool Tea, a "medium ash brown," which is as close to my natural color as I can get. Note: I love the convenience of those little pads you can buy in jars but they really irritate my eyes. I finally found this brand that is very gentle and still works very well. Note: My mum turned me onto Philosophy - and I absolutely love it. This cleanser is sooo gentle and it can be used by all of us. (It's kind of non-gender specific and it smells quite mild, nearly fragrance-free.) I like gentle products because my skin can be sensitive. I just use this in the shower and again at night with warm water. Note: When I turned 40 I started thinking about anti-aging products, but I really didn't know what to look for. And as I have sensitive skin, I didn't want to use anything harsh. My mum actually gave me her bottle of Miracle Worker to try last year, and I absolutely LOVED it! It really improved the texture and tone of my skin. So naturally, I've continued using it! It is a bit expensive, but it lasts a good long while. I just use two small pumps on my face and neck before applying my moisturizer. I can honestly say, more than anything else, this stuff has made a real difference in my skin's appearance. Definitely worth the money! Note: I've used Oil of Olay since I was a teen - I love how it smells, so light and clean. I used to use the pink bottle (original formula), but now I use the yellow bottle (sensitive skin/SPF15). I use it morning and night. I don't use a night cream as I find them too greasy, but I am looking for a nice neck cream - I think age shows here first - so I'd love suggestions! Eye cream: Not at the moment. They seem a bit too rich for my skin. Do you get any regular facial treatments? A couple of times a year I get a facial at a local day spa. It's called a microdermabrasion, I believe. I usually have it done around my birthday (I often receive a gift certificate as a gift) and then, if I remember, I have it done again at the end of summer. Note: I only wear this when I'm spending significant time outside. Otherwise I rely on my daily moisturizer (which has UV protection) as well as sunglasses, and occasionally hats. I do tend to avoid the sun because I burn pretty easily. Do you use any special makeup tools? Just an eye lash curler, which makes a world of difference! Notes: I'm not very adventurous when it comes to makeup - in fact, I haven't changed this routine up in years! I don't wear makeup everyday, but any day I'm going out. I find, especially as I get older, even just a little color really brightens up the face. Long or short? Short ... I can't stand the feel of long nails! It's a sensory issue, lol. Do you wear polish? Rarely on my fingernails, but in the summer my toes are always polished. Do you get manicures? No. I did before my wedding, though, and it was lovely. Favorite hand/foot lotion: Nivea Cream every night before bed. Curel Daily Moisture (Fragrance Free) during the day on my hands which get washed a lot! Soap or body wash? Caress "Daily Silk" Body Wash with a shower pouf. Note: Another item I've used for years - because it leaves my skin super soft and it smells incredibly fresh. Also - and this might be TMI, but - Bill loves the way I smell, and since I don't wear perfume it's due mostly to this. So naturally I don't plan to change my "scent" anytime soon! Note: I was absolutely perfume crazy when I was a teen! But since becoming a mom I find perfume overpowering and EB has a sensitivity to strong smells. So as noted above - I rely on my body wash to smell good! Body scrub: Trader Joe's Lavender Body Scrub - every once in a while, on the elbows, knees and heels. Shave or wax? Shave. Waxing is scary! Note: I am incredibly picky about lotion - it has to feel a certain way on my skin, particularly on my hands. It has to leave them feeling thoroughly quenched, but not greasy - and smooth but not tight. Lol, it sounds crazy, but I know it when I feel it and I've been using Curel for many years because I've found it to be the best. I choose fragrance-free for the reasons stated above. I keep large pump-bottles in the kitchen and bedroom. I hope at the very least this was kind of fun to read ... it was kind of fun to put together! So let me know your thoughts, or if this was entirely tiresome, lol - never fear. You know I'll be back with something completely different tomorrow. That's just how I roll. Have a good night, everyone ... see you again sometime tomorrow! 1. What's your middle name? It was Michelle, now it's my maiden name. A Red Sox t-shirt, navy blue shorts, no shoes. 4. What color are your bed sheets? 5. Who was your third grade teacher? 6. What is the weather like right now? Clear and muggy. Ground is wet from overnight rain. 7. Do you know how to ski? 8. What was the last thing you drank? I just took a sip of my coffee. In the States ~ Vermont. Abroad ~ Ireland/England. 10. Favorite article of clothing? 11. Do you prefer baking or cooking? I like both, but I prefer baking. 12. Is your hair above or below your shoulders? 13. What drink do you order when out? 14. What book are you reading? It's hard to remember - I think it involved cats. 16. What was the last movie you went to? Hmm ... it may have been How to Train a Dragon. 17. Any injuries at the moment? Aside from a mosquito bite, nope. 18. What color is your bathroom? 19. What's the state of your laundry right now? Ugh, it's neverending. I have a huge pile to fold and a good size pile to throw in the wash.
20. Do you take vitamins? 21. Where do you love to shop? Barnes & Noble, Whole Foods, Michaels, Williams-Sonoma. 22. How often do you buy groceries? Once a week at least. Usually a big shop on Saturday and then a quick stop midweek. 23. Do you have a pet/pets? We have a 19 year old cat named Smokey and a 2 year old fire-bellied toad named Figaro. 24. If you are married, when is your next anniversary? We celebrate 17 years next month! 25. How do you take your coffee and/or tea? Coffee ~ extra light with one sugar; tea ~ milk and one sugar. 26. Mac or PC? Desktop or Laptop? 27. Favorite month of the year? 28. Do you have a hobby? 29. What salad dressing do you prefer? Blue cheese if I'm splurging, otherwise a light vinaigrette. 30. Live or fake Christmas tree? We're going back to a real one this year. 31. Did you walk or take a bus to school? I walked to grammar school, took a bus to high school. 32. Do you have any phobias? I'm not so good with heights. Escalators - and to a lesser degree, elevators - freak me out. 33. What's your favorite snack food? 34. When do you take your shower/bath? 35. What time did you get up this morning? Woke at 2:30 and 4:30 (thanks to Earlybird), but finally got up at 5:30. 36. What's your favorite animal? 37. Have you ever broken a bone? Two toes a couple of years ago and I cracked a rib this spring. 38. Do you wear makeup? Yes, but only if I'm going out: blush, eye pencil, mascara, tinted lip gloss. 39. Do you speak any foreign languages? Not really. I knew French pretty well at one point but I've lost it. 40. Have you ever played a sport? Not by choice, lol - though I was a cheerleader for several years. Bookworm's lab supplies from Oak Meadow. 42. What's on your desktop? 43. What is your home page? I loved Clue and Yahtzee when I was a kid. I like Taboo now. 46. What class did you like best in high school? In college? French in high school, and journalism in college. 47. What would you do with an extra hour each day? 48. Do you have allergies? I'm allergic to almost every antibiotic known to mankind lol. 49. Are your nails painted? 50. Where are you right now? Technically I'm in the dining room, but I'm standing at my kitchen island. If you do this at your blog, please leave a note! 1. What is your occupation right now? Homemaker/Homeschooler. 3. What are you listening to right now. The clink and clank of dinner dishes being cleared. 4. What is the last thing you ate? A bite of garlic bread. 5. Can you drive a stick shift? No - but believe me, I've tried. 6. Last person you spoke to on the phone? Bill called me on his commute home. 7. Do you like the person who sent this to you? Yes! Both Kim and Leigh are wonderful friends and fellow homeschooling mums. 9. What is your favorite sport to watch on TV? Football - though as far as I'm concerned the season is over. 10. What is your favorite drink? Non-alcoholic: coffee with cream. Alcoholic: Cabernet Sauvignon. 11. Have you ever dyed your hair? I was, briefly, a blonde in college. These days I do - ahem - cover a bit of gray. 12. Favorite food? Pizza - I could eat it every day. 13. What is the last movie you watched? Bill and I watched Speed on HBO the other night. 14. Favorite day of the year? Labor Day. 15. How do you vent anger? I asked those who would know best: my loved ones. Survey says I "never" yell, but I can "fume" with the best of 'em. 16. What was your favorite toy as a child? My baby dolls and my play kitchen. 17. What is your favorite season? Autumn. 18. Cherries or Blueberries? Hmmm. Tough call. Blueberries, I think. 21. Who is least likely to respond? 22. Living arrangements? Average size, full-basement ranch - shared with 3 boys, a husband and 2 cats. 23. When was the last time you cried? This afternoon. 26. What did you do last night? Watched Lost with my husband. 27. What are you most afraid of? Any kind of harm coming to my family. 28. Plain, cheese, or spicy hamburgers? Cheese, please. 29. Favorite dog breed? Cairn or West Highland Terriers. 30. Favorite day of the week? Friday. 32. Diamonds or pearls? You really can't go wrong either way. 33. What is your favorite flower? Winter: Snowdrops. Spring: Daffodils. Summer: Morning Glories. Autumn: Football Mums. 34. Favorite Hobby? Blogging! Closely followed by reading and (paper) journaling. Thanks for stopping by this evening. Have a good night, and I'll see you all again sometime soon! I saw this meme a long time ago at Tracy's Seaside Enchantment. Today it's time to pull it out of the drafts folder! 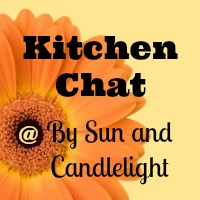 Make a menu plan for next week. Start a shopping list for Saturday. Move to a farm in Vermont (taking my whole family with me). Design a dream house (complete with a barn studio). Fund an autism support center. Buy an RV and travel the country. I saw this meme at Paula's, so I tagged myself! Turkey with tomato and bacon, on a honey-wheat bun. I have cats now, but growing up it was Duncan and Natasha. Crossword puzzles - I love 'em. L is for last restaurant you ate at? We ordered Papa Gino's last week, does that count ...? Tonsils when I was 4 or 5, three childbirths at 26, 30 and 32. I honestly can't think of one, but I don't like to dwell anyway. 6:15 ~ Bill let me sleep in (I've been under the weather). Red peppers (especially with ranch dip). Procrastination. It gets me into more trouble. Dental, mostly. A few ultrasounds lately. An organic brown sugar toaster pastry. 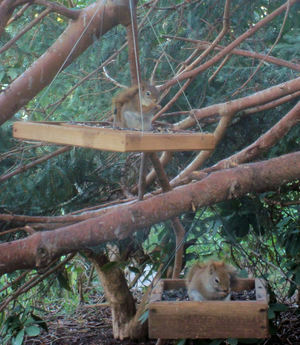 Outside My Window ... there are two little red squirrels at the feeders. I am thinking ... about re-doing my homekeeping notebook. From the kitchen ... soft turkey tacos, peppers and rice, rhubarb cobbler for dessert. I am wearing ... a short-sleeved blouse and a pair of denim capris. I am creating ... new pages in my journal. I am going ... to spend as much time outside as possible this week. I am reading ... the morning Globe. I am hoping ... to learn how to knit (red, cotton) socks, per Crackerjack's request. I am hearing ... a titmouse calling to his mate, laughter, a school bus trundling by. Around the house ... a lot of toys that need to be put away, bed linens to wash, books of all kinds on display, open windows letting in the spring air. One of my favorite things ... savoring my coffee all morning long. A Few Plans For The Rest Of The Week: Catching up on my correspondence, hosting friends for lunch, planning Forest School, making Mother's Day cards with the boys. 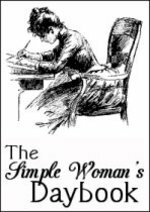 "I used to ask myself this question as I mopped up spilled juice, bribed a stubborn two-year-old to eat four more bites of macaroni, tried in vain to carry on a conversation with my husband, saw my own dinner get cold as I jumped up for the twelfth time to get more milk, the salt, the ketchup ... I had to laugh when I read a meditation by a famous monk in which he suggested that mindfulness includes setting your table and planning your mealtime so well that you would not have to leave your chair once you sat down to eat. Easy for a mystic, I suppost, but impossible for a mother. So why do we bother?" "Perhaps it is because mealtime offers us an opportunity each day to celebrate being a family. 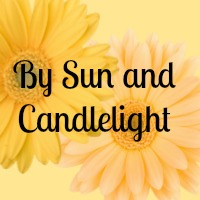 In a world that is full of change and inconsistency and uncertainty, we each have a place that is really ours, a place at our own table, and we can come together there and nourish our bodies and our souls, as human beings have done since before time began." OK, that's a nicer note to leave off on. :) It's such a wonderful book, and as I've mentioned once or twice or ten times now, my friends and I are starting a book study on this very title next month. If you'd like, I'll post our thoughts as we go along (the condensed version of course). 3. DO YOU LIKE YOUR HANDWRITING? Yes. 4. WHAT IS YOUR FAVORITE LUNCH MEAT? Hmmm, I guess chicken. 5. DO YOU HAVE KIDS? Three boys. 6. IF YOU WERE ANOTHER PERSON WOULD YOU BE FRIENDS WITH YOU? I'd like to think so! 7. DO YOU USE SARCASM A LOT? I'm not that clever. 8. DO YOU STILL HAVE YOUR TONSILS? No. They were removed when I was 4. 9. WOULD YOU BUNGEE JUMP? Goodness, no. 11. DO YOU UNTIE YOUR SHOES WHEN YOU TAKE THEM OFF? Usually. But I hardly ever wear laced shoes. 12. DO YOU THINK YOU ARE STRONG? Yes ... and no. 14. WHAT IS THE FIRST THING YOU NOTICE ABOUT PEOPLE? Like Amy said, how friendly or open they seem to be. 15. RED OR PINK? Either, but I like yellow better. 16. WHAT IS THE LEAST FAVORITE THING YOU LIKE ABOUT YOURSELF? I worry too much and I always think whatever's wrong, it was my fault. 17. WHO DO YOU MISS THE MOST? My maternal grandfather. 18. WHAT COLOR PANTS AND SHOES ARE YOU WEARING? Navy blue pants, pink socks. 20. WHAT ARE YOU LISTENING TO RIGHT NOW? Earlybird's running commentary about The Complete Cosmos (a show we Tivo'd). 21. IF YOU WERE A CRAYON, WHAT COLOR WOULD YOU BE? Dandelion (You can see it here). 22. FAVORITE SMELLS? Balsam, almond, rose. 24. FAVORITE SPORTS TO WATCH? Football ~ Go Pats! 25. HAIR COLOR? Dark brown. 29. SCARY MOVIES OR HAPPY ENDINGS? I can't stand scary movies. 30. LAST MOVIE YOU WATCHED? Return of the Jedi with the boys. 31. WHAT COLOR SHIRT ARE YOU WEARING? Pink. 32. SUMMER OR WINTER? Winter. 33. HUGS OR KISSES? Depends! 34. FAVORITE DESSERT? Pound cake with fruit and whipped cream. 36. WHAT IS ON YOUR MOUSE PAD? I have a laptop, but I love using a wireless mouse. My mousepad has a lovely blue bird on it. 37. WHAT DID YOU WATCH ON T.V. LAST NIGHT? Nothing. Well, Bill watched Hardball, but I read. 38. FAVORITE SOUNDS? Songbirds, church bells, rain hitting the roof as I fall sleep. 39. ROLLING STONES OR BEATLES? Beatles, I guess. 40. WHAT IS THE FARTHEST YOU HAVE BEEN FROM HOME? California. 41. DO YOU HAVE A SPECIAL TALENT? I can sing the alphabet backwards really fast. 42. WHERE WERE YOU BORN? El Paso,Texas! This is actually an e-mail survey that my sister-in-law sent me yesterday - and just in the nick of time, too! I'm having some dental surgery today (oy, long story) and I suspect I may not feel up to blogging tonight. So instead, here I am blogging ahead, lol! If you'd like to grab this meme for yourself, be my guest! I have always had and loved real trees. But then I had a child with sensory issues and cats with a penchant for eating (and promptly throwing up) greenery. Moral of the story: we now have a fake tree. It's nice, but I do miss that smell. Ideally it would be Epiphany, but sometimes I get itchy and we take it down on New Year's Day. The flannel nightgowns I received every year on Christmas eve. Yes - one the children can play with. Honestly, I can't think of one. It's a Wonderful Life - though I admit I do love A Christmas Story, too. Usually in the fall, but in earnest after Thanksgiving. My cousin Sue's iced butter cookies and my mum's penuche fudge. White lights or colored on the tree? White. Though I have extremely fond memories of the large multicolor bulbs of my youth. Travel for Christmas or stay at home? We make everyone come to us, lol. Can you name all of Santa's reindeers? Yes- I just hummed the opening stanzas of Rudolph the Red-nosed Reindeer to be sure. Open the presents on Christmas Eve or Christmas Day? Always on Christmas Day (except when I was little my grandarents always had *A* gift for the kids to open after dinner). Most annoying thing about this time of year? What I love most about Christmas? When does fall begin for you? It starts stirring in my heart roundabouts midsummer, but I feel it is officially fall, come Labor Day. 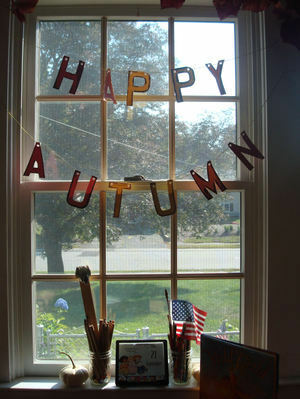 What is your favorite aspect of fall? I love so many things about my favorite season: the changing leaves, the crisp air, the shorter days. And I really love the return to routine after the summer. What is your favorite fall memory? My wedding day, fourteen years ago this month! We had cornstalks, pumpkins, bittersweet, candles and even a scarecrow bride and groom! What do you like to drink in the fall? I loooove hot cider. Especially when I'm drinking it in Vermont on a cold crisp morning! I also enjoy pumpkin spice lattes from Starbucks. They're pretty much the only flavored coffee I will drink. What is fall weather like where you live? I think fall is New England's best season. We have lots of warm days, but generally the air is crisp and clear. It's not until November that it starts to get cold, and damp. What does fall smell like? Woodsmoke, apples and cinnamon. Holiday shopping in fall: yes or no? Yes! Though mostly online. But no decorating or anything. Not until after Thanksgiving at least! If you could go anywhere in the fall, where would you go? VERMONT! Wha t is your favorite fall sport? I love football Sundays - GO PATS! What is your favorite fall holiday? Thanksgiving Day. What's your favorite kind of pie? Pumpkin with whipped cream. What was your favorite Halloween candy? Three Musketeers. Which do you prefer, the Farm or the Fair? Since we go to the farm all year long, I guess I'd have to say the Fair. Do you have a favorite fall book? The Smartest Bear and His Brother Oliver (from when I was a little girl), Fletcher and the Falling Leaves and Hurry, Hurry, Mary Dear. How about a favorite fall poem? I popped on over to tag Soutenus for the "Picture of Now" meme and spotted this quiz at her place! Since Bill and I are heading out tonight to see Harry Potter and the Order of the Phoenix, I thought this would be a bit of fun for the day. Hmmm, that's a hard choice seeing as how I have no idea how either would taste. They both sound good, actually! But I think I'd go with pumpkin juice. Butterbeer - it sounds much tastier. I'd want to be in Gryffindor, but Ravenclaw wouldn't be so bad. Ravenclaw because I skipped kindergarten and I'm skipping 7th grade math. A red squirrel - small, fast and feisty. I'd want to say dog because it's my favorite animal, but I think I'd choose to turn into a falcon because they're a top predator like dogs and wolves, just below humans, plus they can fly. Scratch all that. I would want to be a dragon. Mrs. Weasley, lol. I worry about those kids! I'd probably say Ron because he's pretty funny and doesn't have too much pressure on him, but he's still really helpful. I'd probably want to be keeper because I love being the goalie in soccer. I like to not have too much pressure on me as the seeker would. Professor Lupin, because he was such a good friend to Harry. I'd say Professor McGonagall. The funniest part was when she argued with Umbridge over Harry becoming an auror. Though Dumbledore's dead, he'll be able to talk to (guide?) Harry, possibly through a portrait. We'll find out why Dumbledore trusted Snape all along, and Snape will ultimately fight for the good side. I think he might die saving Harry or Malfoy. I think Draco will fight beside Harry before it's all over. I'm not entirely convinced Dudley and Petunia are non-magical. Ron and Hermione will be a couple in this and I refuse to believe that either one of them will die in this book. I fear for Neville and I think he still may have a part to play in the prophecy. I also fear for Hagrid - he might die saving Harry (or one of the kids). I think RAB is Regulus Black and possibly he is an animagus. I think, judging by the cover art, Harry and Voldemort end up in a duel of some sort with lots of people watching them. It looks like Harry has something around his neck (probably a horcrux). I think Harry will ultimately defeat Voldemort, but at a great personal price. There's going to be a Triwizard Tournament in it and it's going to be that Voldemort bets his last horcrux on it or the trophy is the last horcrux. And if it turns out that Aunt Petunia's a witch then it's very likely going to be that Petunia dies bouncing his spell back at Voldemort to protect Harry. Also, RAB being Regulus seems too obvious to be JK's work - it will probably be something else. I think Snape is good and it could very easily be that Lupin helps him prove that. Lupin just might come back and help Snape become good. So there you are! If you do the HP meme (or the mythological quiz for that matter), please drop me a comment below. Have fun! I saw this meme just now at Matilda's and I had so much fun reading her answers, I decided to play along! :) I fear I won't be nearly as witty as she, but here are my answers all the same. b. What associations does the main color invoke? I feel very feminine in it. It's one of my favorite tops; you can see it here in this post. c. Is there a memory associated with this outfit? Not really, other than that post I linked above. 2a. Are you listening to music? Yes - well, sort of. It's the background music to a documentary about trolley trains. No, just Earlybird's nightly request. c. What does the music make you remember? 3a. Describe the objects within arm's reach. A glass of really nice Chardonnay (it's Friday! ), a stack of Mary Engelbreit magazines to look through (August/September and October/November issues going back to 1996), two favorite books A Blessing of Toads by Sharon Lovejoy and Autumn by Susan Branch, the ed. plan (due to be mailed tomorrow), my sweet little Penny, and the phone (which finally works!). b. Choose one object and tell where you acquired it. Oh, well, that would have to be A Blessing of Toads which is the loveliest nature book I have ever laid my eyes on - filled with charming essays, ideas and inspiration. It was a very thoughtful and generous gift from the author herself, and I will treasure it always. c. On the whole, are the objects new (memory blank) or old (memory filled)? 4a. What room are you in? The dining room (aka the learning room). b. To what extent is it yours? Well, I do have a corner set up with my own bookcase and my tote bag and a computer area all to myself. In other words it holds more of my stuff than anyone's. 5. What were you doing before starting this post and what would you like to do next? I was pasting together a MAMMOTH nature photo post. Next I would like to watch TV with my honey and soon thereafter go to bed. The always thoughtful Cheryl tagged me for this beautiful meme, and I am honored to play along. 1. He's known me longer than anyone else. 2. He gives me peace. 3. He loves me despite all my faults and what's more, He forgives them. 4. He gave us His beautiful mother. 5. He listens when I talk; He understands when I don't. I tag: Paula, Jennifer, Lindsey, Ruth and Kristen. I'll tip my bonnet to Kristen as hers is the first place I saw this clever meme. Thanks, Kristen! Oh, Good - a Meme! I know - you were thinking the same thing, right? It's been far too long since I've bored amused you all with a bunch of insignifcant trivia about myself. ;) But I saw this at Moomin Light and thought - Hey, I could use one of those today. So here it is, and help yourself to it if you too are in need of a fun, easy post. Let me know (in the comment box) if you do it! Don't think so. But my dad really wanted Dawn while my mum really wanted Michelle. I ended up Dawn Michelle. Dawn is a fairly uncommon name, but there were three Dawns in my kindergarten class! Oh, I'm embarrassed to say it was at Pirates of the Caribbean III. Yes, I'm a bit obsessed with it actually. I like plain roast beef (not Italian) with Swiss cheese, on a baguette if possible. Three awesome boys - 5, 7 and 11-about-to-turn-12 tomorrow. No, almost never. I just can't pull it off, plus, it tends to sail over my head. Nope! I had them removed when I was 4 or 5, I think? I still remember them putting the mask over my face and telling me to count backwards from 10. I remember them giving me a shot and telling me it would feel just like a mosquito bite (ha!). I remember waking up in the recovery room and screaming for my mother and a very mean nurse telling me - in so many words - to shut up. I hardly ever eat cereal, but I loved Honeycombs as a child. Actually, if I could choose any cereal it would be hot Irish oatmeal with cream and brown sugar. Yum! Breyer's Natural Vanilla (though I also like peach ice cream and blackberry sherbert). Their manner and way of speaking. I like both, but I think I prefer red. Olive colored shorts, brown sandals. The "crusts" of Crackerjack's waffles. Birds singing and the breeze outside my window. Can I say coffee? Hmmm ... pretty cookies like these with a cup of coffee. At the theater: Pirates of the Caribbean III. At home: The Land Before Time. Light blue with a splash of flowers across the front. Winter. I've been told I am a winter (as in fair skin, dark hair, light eyes) but I also prefer winter, as a season, over summer. I realize I am in the distinct minority with that choice, but I'm OK with that. Depends on who's giving and receiving! See Favorite Food, above, though a cup of coffee is really all I need, perhaps with a splash of something to make it interesting. To the boys: The Hardy Boys and the Tower Treasure. To myself: Plantation: A Lowcountry Tale. I plan to read this and this next. Love summer reading! A pretty blue bird on a branch. WHAT DID YOU WATCH ON T.V. LAST NIGHT? Big Love on HBO. At the risk of sounding mysterious, at an army base somewhere in the deep south. Have a great day, everyone! Happy Summer!! "While gray squirrels are busily burying their single acorns here and there for the long winter that lies ahead, and red squirrels are stashing their winter supplies in various safe places, the chipmunk is busily gathering nuts and seeds and bringing them back to its burrow." If you decide to play along, visit KC and leave your link! Theresa tagged me with this fun meme - or rather, she tagged my bag! The gist of it is to show the contents of your pocketbook in all its glory (or not). The good (pretty wallets), the bad (old receipts) and the ugly (half-eaten fig newtons). 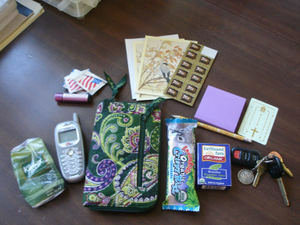 All of these things are known to show up in my purse, but let's take a look inside today. Actually, you've caught me on a good day because I just cleaned it out! (Convenient, huh?) And just so you know, I threw out some crumpled tissues, old shopping lists, cracker crumbs and Dunkin Donuts napkins before I began replacing the contents. 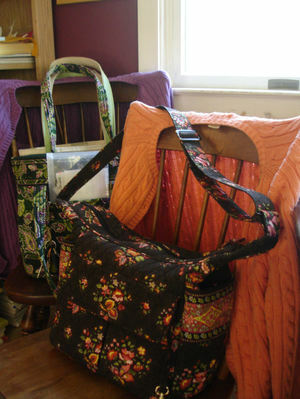 I try to stay on top of my bag because when it's messy it really fouls me up. 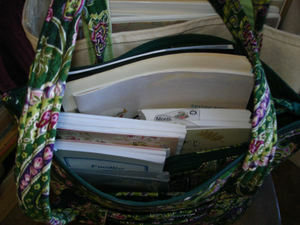 Per my weekly routine, I assign the task of cleaning out my pocketbook to Thursdays, as part of my "desk day." Saturday is when I do the bulk of my errand running, so it pays to have my bag ready to go bright and early that morning. Do I always match my cardigans to my purses? Here's a peek inside. It's particularly stuffed today because we have speech Friday mornings, so I bring some things to look at while we're there. Let's dig in shall we? 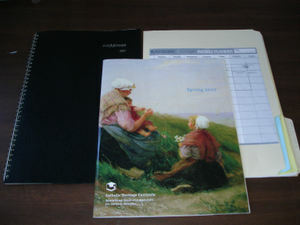 Here we have, left to right, my month-at-a-glance planner, the Spring 2007 CHC catalog, and my weekly folder (described in better detail, here). I also keep my journal with me at all times (the notebook on the left). I've blogged about my journals before - which are catch basins for all the thoughts that race through my head in a given day. I've switched to a smaller size because I find it more manageable than the standard size notebook. As you can see I like to dress it up a bit - a bit of scrapbook paper and a page from my page-a-day calendar. This tells me at a glance the date this notebook began (I fill them up in a month or two). 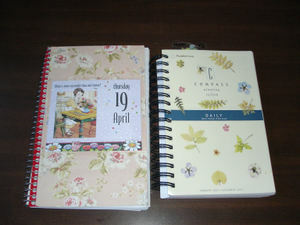 On the right is my fairly new datebook. It is made by Franklin-Covey, a company that makes planners I've long admired and at one time used excusively. At some point I stopped using them because they really didn't mesh with my mothering/housekeeping/homelearning lifestyle. I am forever in the process of making my own customized planner, but for now, this spiral-bound page-a-day calendar seems a good fit. I needed a place to write down things for a specific day, and this has all 365, in a size that's easy to manage. Obviously I couldnt leave the plain butter yellow cover alone - pretty though it was - and added all those nature stickers to make it more "me." Next we have a brochure from the Hallmark store (I signed up for their frequent shopper program recently). 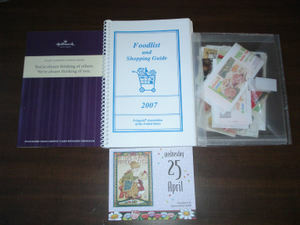 In the middle is our Feingold Shopping Guide and on the right is my coupon packet. I really need to purge that packet! I also keep those retired page-a-day calendar pages for notes and weekend errands lists. They fit perfectly inside the coupon packet, and the packet fits perfectly in my bag's outer pocket. 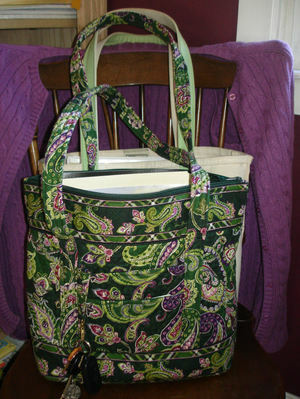 So there you have it - my bag inside and out. How about you? Would you be willing to share with us what your bag looks like right now? I'm tagging anyone reading this post who would like to join in! Leave me a comment and I'll link you! I know, it's been far too long, hasn't it? :) I saw this at Lindsey's and it looked like fun! 1. kissed someone? Oh, kisses all around. Bill kissed each of us before he left for work. When the boys give us kisses we call them smooches. 2. drank coffee? Two seconds ago I took a sip! 3. read a book? Currently, I'm reading Cricket in Times Square and Harry Potter and the Order of the Phoenix - both in preparation for Book Group. I'm also reading bits and pieces of Mrs. Sharp and Home Comforts. 4. cursed? I don't mean to sound like a goody-two-shoes but I never curse. 5. had a nightmare? I had a bad dream about one of my cats needing emergency surgery the other night. 6. checked your email? Just a few minutes ago. 8. drove a car? This morning, my van, to speech and back. 9. rode a roller coaster? I rode a miniature coaster with the boys at the fair last fall. I don't go near the big ones. 10. took a nap? I only nap when I'm sick (I can't nap otherwise). That would have been Palm Sunday three weeks ago. 11. went to the movies? We saw Meet the Robinsons a couple of weeks ago. 12. drank alcohol? A glass of red wine a few nights ago with dinner. 13. went to a party? Well, Easter was a party, though we didn't go out! Last night I hosted a meeting, and that felt like a party to me - candles lit, classical music playing, coffee and cookies! 14. said “I love you"? Two minutes ago I told Earlybird I loved him as he settled in for a nap. 15. cooked a meal? Goodness, it's been a few nights! Two nights ago we ate leftovers and last night I sent Bill and the boys out for dinner while I had my meeting here.